Whilst talking with an old friend in Dublin recently we were discussing Prime Minister Gonsalves. For this letter I will describe my friend as Paddy. That’s not his name, nothing like his name, but will hide his persona from any collective spite that may just be gathered against him after this little tête-à-tête. 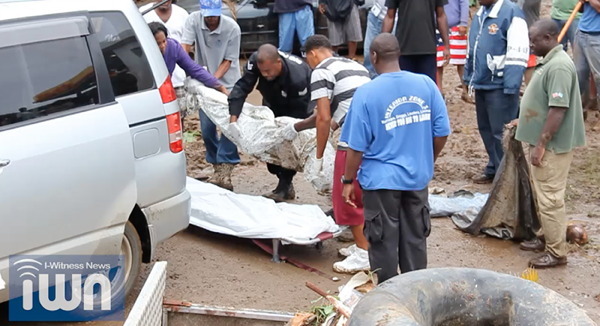 He follows both the printed news and the online news very carefully regarding Saint Vincent and the Grenadines. As a child his parents were posted in SVG and he has holidayed there a thousand times since becoming a man. He loves our little country and has fond memories of us as a people, our verdant island and the beauty of the white sanded Grenadine pearl necklace of islands. When Ralph Gonsalves announced the finish and operational dates for the Argyle International Airport, we must ask ourselves if he knew each of those dates was unachievable. I like many others believe he did know that the completion dates he gave us were not just unachievable, he knew that such statements were downright lies. When you tell lies sooner or later your very own lies will come back and bite you in the arse, as the old folk would say. Saying the airport would definitely be up and running by 2011 may very well have caused all sorts of business people who were ardent followers of Gonsalves, to invest money in their business’s to take advantage of the upswing in trade that the same Gonsalves claimed would follow the airport opening. He also told the people that he would build a city on the Arnos Vale site when the air traffic was transferred to Argyle. He said the new city would be linked to the old city of Kingstown by a four lane tunnel under the hill, it doesn’t matter that approaching the tunnel from either end it would only be one lane. The whole matter was embroidered to wind the business people into spending money. Hotels in Villa who are ULP supporters have invested fortunes in upgrading their family owned hotels in anticipation of the Gonsalves forecast of a huge surge in stop over’s and business in general. People like Ken Boyer borrowed money from banks to build his supermarket and Kentucky Fried Chicken outlet, why? because as a cousin to Gonsalves he believed that Gonsalves would finish the airport by 2011 and the new city would be finished five years after that in 2016. Ken was a little silly because he should have known better than most of Gonsalves ability to make things up, to embroider the truth and make it into blatant lies. In a speech on national television, Venezuela’s president Maduro reports that the air defense areas of the country have been expanded beyond the Windward Islands all the way up to St Maarten. 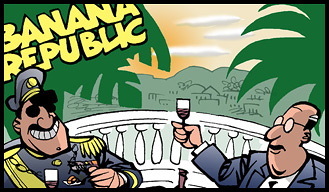 President Nicolas Maduro, said that his country has the right to defend itself in the skies above the Dutch Antilles. Venezuela is already a bully of the seas claiming areas that it does not own, now it appears they are trying to bully the airspace. We have to remember how PM Ralph Gonsalves supported Venezuela’s sea grab of Bird Island. Just what kind of betrayal was that? 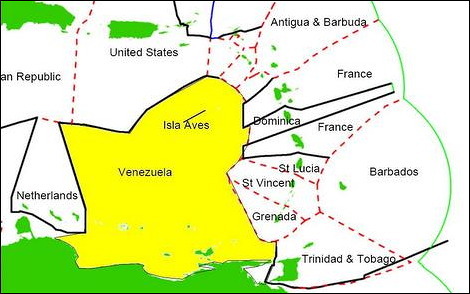 The yellow area shows the Venezuelan Economic space, with the effect of Aves Island/Rock. Under the International Law Of The Sea Aves Island is classified as a rock which does not get the 200mile economic zone, however Venezuela hasn’t signed the UNLOS treaty. 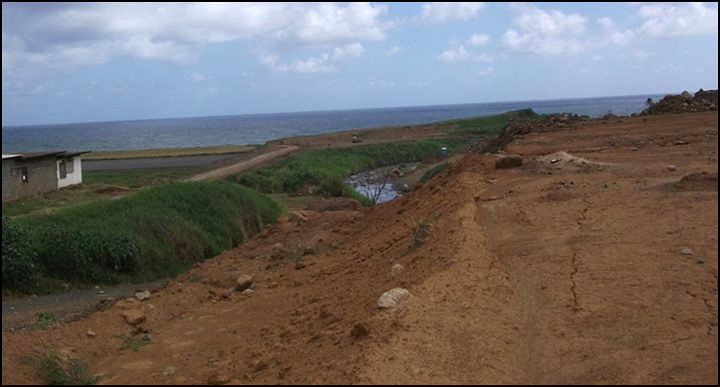 This rock effectively removes a significantly removes most of the OECS’ economic zone. A river runs through it… Argyle Airport runway, that is! If anyone tells you that aircraft will land at Argyle in 2015, then that person is lying to you. The middle of the Argyle airport runway is a river and a muddy wasteland. The Argyle airport will take at least four more years, and even then, it will not be a functioning airport. Since 2006, we have been bombarded with ULP regime nonsense about how the Argyle airport will boost the economy, but the reality is Argyle has been a curse to our country. 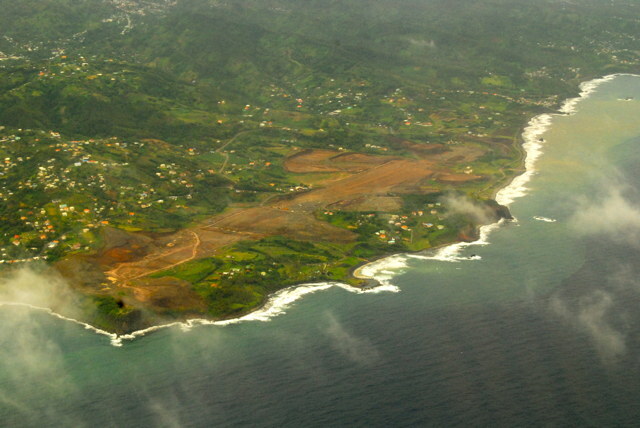 Throughout SVG, towns, villages and communities have been starved of jobs and money, all for the sake of building Argyle airport for tourists. From Fancy to Fitzhughes, Union Island and beyond, the needs of Vincentians have been ignored. Hospitals have fallen to ruin, the economy is virtually dead and the country is littered with tombs that once used to be flourishing businesses. The consequence has been high unemployment, high crime, destitution and poverty. Vincentians have been made to suffer under the economic delusion that tourism and the Argyle Airport will bring prosperity. Well, they will not. Having an airport does not guarantee prosperity. Barbados has had an international airport since 1938 and tourism for over 60 years, yet Barbados laid-off 3,000 government workers in 2013 and rolled out yet another national poverty alleviation programme a few years previous. We have been lied to time and again, being told that Argyle airport will be finished in 2011, 2012, 2013, 2014 and 2015. One need only look at the muddy mess at Argyle to know that it will not be finished in 2015, 2016, 2017, 2018 or 2019.